Tina's Crop Shop: GIU Blog Hop - Welcome To The Hood! Hello and Happy Sunday! I hope today is a wonderful day and full of blessings! 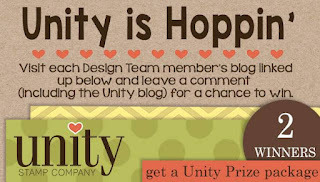 Today I am blessed and honored as a former GIU Gal to be in a Unity Stamp Company blog hop! How cool is that? 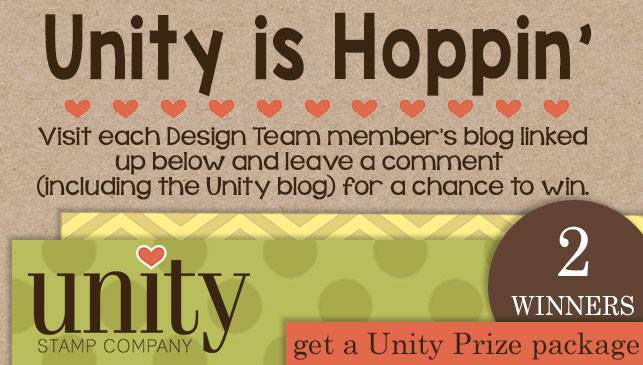 As you'll see you have a chance to win a Unity Prize package just by commenting on this hop! Even cooler, right? I'm sure you'll also have some awesome inspiration along the way! Have you seen Unity's new release? They have some awesome stamp sets available now. As soon as I saw their Facebook Live Release Presentation I headed over to purchase a few sets! One of my favorite new sets has birds.. called Lift Me Up Birdies! Seeing it reminded me that I hadn't used my Welcome To The Hood stamp set that I purchased a while back so it was time to pull it out! So if you are a regular follower, you know I have a love of all things shaker.... so I decided to go shaker with this adorable set. My first instinct was to stamp on white cardstock but I decided to try it on Pool Party since I wanted a blue sky to see if I could manage a light color wash of the birds on colored cardstock. All of my stamping.. including the sentiment was stamped in Versafine Black Onyx Ink and heat embossed in clear. The embossing helps to keep the colors inside the images. Well.. it worked on the colored cardstock and I was super happy! I used some distress markers scribbled on an acrylic block and an aqua painter to color in the birds. Since I was coloring on regular cardstock instead of watercolor paper, I was light with the water and that also helped it to dry super quick. I filled my shaker window with some Lucy's Little Things Sea Spray Sequin mix. I thought it turned out super sweet and I hope you loved it too! Tina Rackley Riddle <--- You Are Here! This is a super cute card!I love the paper too. Oh my! This is an incredibly sweet shaker card. Love the colors and the rustic look. I am in love with this card!! Such a cute card! I have the Welcome to the Hood set and don't think I've ever used it. It's time to pull it out! I love how you framed everything. I always stamp on white cardstock. Thanks for the idea to try out other colors! Yours look great! love the birds on the wire...great job! super cute!! I love shaker cards.. sometimes time consuming, but always worth it in the end!!! Such a great card ... still trying to get into the shaker cads (I have made a few). Love this stamp!!! Fun shaker card, Tina! I'm ashamed to say that I have this stamp and have not inked it yet. Beautiful shaker card! The stamp is perfectly framed, you have inspired me to try some shaker cards. Darling card! What a great idea. Fun sentiment to go with this cute birdie shaker card. Beautiful shaker card. I love the colors. I love shaker cards, and yours is wonderful! Great card! So cute!!! One of my favorite stamp sets and it looks adorable as a shaker card. Thanks for the ideas. Just lovely. This is so cute!!!!! I love the shaker card!!! This is a really cute card, love the colours too. Shaker cards a such fun! So cute! Love shaker cards! Your card is cute and fun! Thanks for sharing! That's so cute as a shaker!! cute images and fun sentiment! I love the antique feel of your card and the shaker! Love this card! Very cute design and great colors! Tina, I love your shaker card! Perfect stamp for a shaker design! Super sweet shaker card, Tina! Love those little birds... I think they need to go in my wishlist! TFS! Nice card, I like the Pool Party background. Fun shaker card- great background color- fun! Your shaker is so cute and I like it on the blue!! !